Migration to magento 2. Are you still thinking ? Its high time to Act Now! Magento 2 was released on November 17th 2015 and migration to magento 2 or not has been biggest the question of debate among store owners. During this period lots of merchant made a switch to the new platform. But still there are a big number of merchant using magento 1 and not able to decide to move or stay with the platform. However magento is still supporting and maintaining the former magento 1 and frequently release patches to insure security of the platform. However this support will end in november this year ( 2018 ) and magento will not maintain the code base. What this means to a store owner ? Being a open source platform magento code base is available to everyone and hackers keep on trying to find out their ways to break the system. Such platform requires continuous monitoring and releasing fixes for a potential security problem. End of support means magento will no longer check and release security upgrades for their platform. Any merchant still using it will be responsible to look and maintain such issues on their own. Is this the only reason you should make a migration to magento 2 ? Well, this is the big reason but apart from that magento 2 has lot more other advantages over the former version. These advantages are in terms of features, performance, user experience, marketing, integrations and much more. While making a decision to switch, the best way to decide is by comparing and weighting features of the platform against each other and decide accordingly. In order to make the decision making process easier, we have compiled the added advantage of magento 2 for an online store. Faster loading speed is the key to generate sales online. Loading speed has been a biggest drawback of magento 1 website compared to other eCommerce platform like wooCommerce or shopify. You would need third party extensions such as Varnish or Turpentine to implement full page caching. These extension not only requires extra efforts and investment to setup but we have also experienced lots of malfunctioning happening due these. Magento 2 has inbuilt support for all these important features like varnish and full page caching. Internal caching means faster page load time. That delivers the content of your catalog to customers in fraction of a second and makes the life easier for your back-end processing team. 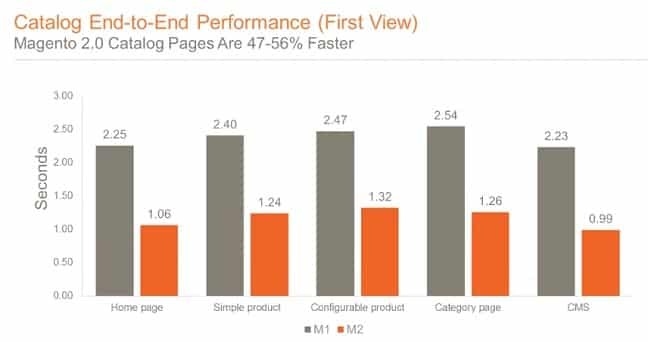 So if website speed has been a concern for you in magento 1, than you get your biggest concern resolved with magento 2. Customer will definitely enjoy faster loading website and that surely leads to more conversions. Conversion optimisation specialist recommend a faster loading checkout with minimum number of steps and no other distractions on the checkout page. Checkout process in magento 1 was too lengthy and slow leading to higher abandonment. 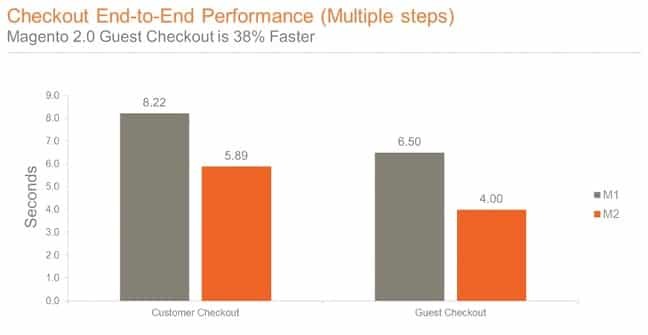 In magento 2 the checkout process is much more simplified, requires only necessory information from the customer and offers easier options of guest checkout and customer login. Email address filed right on the top making it easier for customer to fill in and full information from their account. Allows guest customer to create an account after checkout if they want. Nice compact summary of cart on the right makes it one of the best checkout process for any eCommerce platform. It’s quite obvious for a non technical user to get overwhelmed with back-end of a magento 1 website. User interface, organisation of section, terminology used in magento 1 are all good for a technical person but a non technical merchant find it quite difficult to understand and manage. Magento 2 has simplified the bank-end interface making it more easier for anyone to understand and navigate to required sections. Simplified product creation workflow. Better organisation of important product attribute, simplified process of variant product creation, instant option to create new attribute right from the product creation screen, non technical terminology makes it really easier for any newbie to understand and manage. Magento team recognised the importance of mobile friendly store giving a high priority to mobile responsive technology in the development of theme. Faster loading speed is another added advantage for mobile website visitors. Mobile friendly and faster loading website gets better visibility in search engines and that’s an added advantage for an online store. Flexibility has been the biggest advantage of magento 1 and magento 2 takes this one to another level making it more easier for developers to customise the store as per merchant’s requirements. Regression testing is really important when you roll out a new feature or update. As a developer or store owner you want to make sure that new updates have not impacted any function of the online store. With a inbuilt regression testing framework, Magento 2 is a savior here. This new framework makes it easier to perform functional and regression testing. That way rolling out of a new feature is much more hassle free. How smooth or painful the migration process is? There is an official tool to support migration of data that will help you with migration of data including products, categories, attributes, customers, sales, settings, promo rules etc. However actual painful process is migration of your store theme and any custom or third party extension that is there. 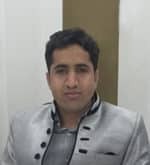 Magento 2 framework is totally different therefore extension & theme can not be migrated directly. All these needs to be redone. Is it worth to move ? Revamping the theme and extension would definitely require investment and time. However this investment is surely worth it. Magento 1 support is ending november this year ( 2018 ) and you should not leave your store at a risk. Rather you should take a decision as soon as possible. Improved speed and checkout process will help you with the improved conversion rate and more sales. November 2018 is not far away now and this is the absolute right time to start on your migration process. Start talking to you solution partner today and layout a migration plan. We at Axis Web Art has been working with magento since 2009 and have a good bunch of certified magento developer and solution specialist. Checkout array of our magento development services and request a quote to get started with your magento 2 migration process in a smooth and painless way.